Description: 18 count Natural linen with Kreinik braid, Brown Paper Packages, Caron Collection Impressions and Sheep's Silk from The Thread Gatherer. Stitches include smyrna and satin. Includes 4 buttons. Description: 32 count Pink Lipstick linen from Lakeside Linens with Anchor floss. Stitches include satin and eyelets. Description: 32 count yellow Belfast linen by Zweigart from Norden Crafts with Anchor floss. Stitches include eyelet, satin and French knots. Description: 18 count Natural linen with Kreinik braids, Rainbow Gallery fibers, Brown Paper Packages, Caron Collection Impressions, The Thread Gatherer fibers and Fabulous Fibers. Stitches include satin and smyrna. 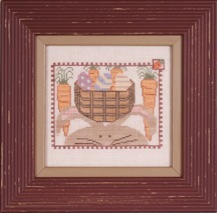 Description: 32 count Sugared Ginger from Lakeside Linens with Anchor floss. Stitches include satin. Includes 2 buttons. Description: 40 count Sandstone linen with Anchor floss. Description: 32 count Flax Belfast linen with Weeks Dye Works and Gentle Art hand-dyed floss. Carrot button by Just Another Button Company. Frame by East Side Moulding 3300ON/OHEB (7-1/4 x 7). Description: Easter Bunny: 32 count dirty linen with DMC floss. Stitches include satin. Bunny With Basket: 35 count Dirty linen with DMC floss. Stitches include French knots. Description: 32 count Lavender Mist Belfast linen with Weeks Dye Works hand-dyed floss. 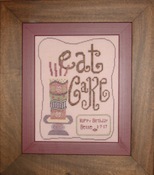 This design is perfect for any celebration! Personalize it as you wish. I chose to honor the woman who has had the most impact in my life, my momma! Frame by East Side Moulding 3100WN/3200CI 7.5 x 9.5. 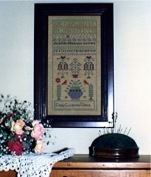 Description: Reproduction Sampler. 36 count hand-dyed Glenshee linen with Anchor floss. Stitches include over one. Description: 32 count Mocha Belfast linen by Zweigart from Norden Crafts with DMC floss. Stitches include French knots. Description: 32 count Examplar linen from Lakeside Linens with Anchor floss and Weeks Dye Works. Stitches include smyrna, rhodes, satin, Kam's coils and stumpwork. Description: 36 count hand-dyed green linen with Anchor floss. Includes number chart for year. Description: 32 count Glenshee linen with Anchor floss. Stitches include over one. Description: 35 count Evergreen hand-dyed linen from R & R Reproductions with Au Ver a Soie silk. Stitches include satin, four-sided and smyrna. Description: 36 count Natural Edinborough linen with Weeks Dye Works and Gentle Art hand-dyed floss. Stitches include: smyrna and rhodes. 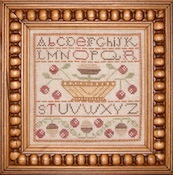 Frame by East Side Moulding Primitive Pearls - Pecan PRL-PN 5-1/2” square. Description: 36 count Natural Edinborough linen with Weeks Dye Works and Gentle Art hand-dyed floss. Stitches include: smyrna and satin. 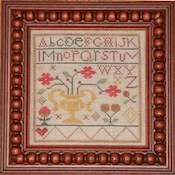 Frame by East Side Moulding Primitive Pearls - Cherry PRL-CH 5-1/2” square. Description: 36 count Natural Edinborough linen with Weeks Dye Works and Gentle Art hand-dyed floss. Stitches include: smyrna, satin, and eyelet. 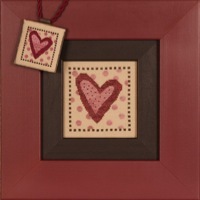 Frame by East Side Moulding Primitive Pearls - Red PRL-RD 5-1/2” square. Description: 35 count Natural Northern Cross linen with Weeks Dye Works and Gentle Art hand-dyed floss. Stitches include: smyrna, satin, and eyelet. 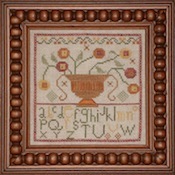 Frame by East Side Moulding Primitive Pearls - Tan/Natural PRL-TN 5-1/2” square. Description: 36 count Taupe linen by Graziano with Anchor floss. Stitches include eyelets, smyrna and satin. Includes button. Description: 40 count Sandstone linen with Anchor floss. Stitches include smyrna. Includes button. Description: Our framed model is stitched on 36 count Summer Khaki Edinborough linen by Zweigart from Norden Crafts with one strand of Weeks Dye Works and Sampler Threads over two linen threads. Our tin necklace (TF11) is stitched on 32 count Summer Khaki Belfast by Zweigart from Norden Crafts with one strand of floss over one linen thread. Description: 36 count Natural linen with Anchor floss. Stitches include satin. Description: 36 count Light Khaki Edinborough linen by Zweigart from Norden Crafts with Anchor floss. Stitches include smyrna. Description: 32 count Natural linen with Anchor floss. Stitches include smyrna and Kam's coils. Description: 40 count Sandstone linen or 32 count Vintage linen with Anchor floss and Sampler Threads from The Gentle Art. Stitches include satin. Description: 40 count Sandstone linen with Anchor floss. Stitches include eyelets and smyrna. Includes number chart for year. Description: 32 count Mocha Belfast linen by Zweigart from Norden Crafts with Anchor floss and Sampler Threads from The Gentle Art. Stitches include smyrna and satin. Description: 32 count Glenshee linen with Anchor floss. Stitches include eyelets, satin and rhodes. Description: 32 count Raw linen with Anchor floss. Stitches include eyelet. Description: 32 count Antique Lavender Belfast linen by Zweigart from Norden Crafts with Anchor floss. Stitches include smyrna, satin and eyelets. Description: 32 count Olive Green Belfast linen by Zweigart from Norden Crafts with Anchor floss. 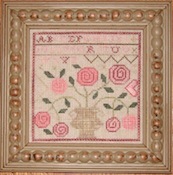 Description: 32 count Cameo Rose Belfast linen by Zweigart from Norden Crafts with Anchor floss. Stitches include smyrna. Includes 3 buttons. Description: 32 count Tempest linen from Lakeside Linens with Anchor floss. Stitches include satin.